Picture the scene: I’m reviewing a game, plodding along nicely, when I get stuck on a trivial bit for what feels like eleventy hours. An obscure puzzle, wonky signposting, or a design that makes judging jumps impossible. Welcome to Trial-And-Errorsville! Population: my tortured psyche. It’s gaming’s equivalent of bashing your head against a brick wall, if the wall were insulting your IQ at the same time. Perhaps it’s an oversight on the part of the developers. Perhaps it’s your own inability to understand what’s being asked of you. You try anything to brute-force your way through a puzzle, you nudge hopefully near potentially grabbable ledges, or make desperate leaps of logic. 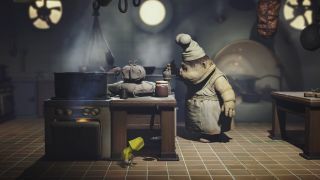 Trial-and-error situations took the shine off otherwise brilliant puzzle-platformer Little Nightmares. I get trapped in a Möbius loop of misery running from one murder-chef before I a) work out I can interact with something that looks like set-dressing, and b) get fudgey controls and physics to behave long enough to escape. Worse, I sometimes stumble across a brainteaser’s solution after much infuriated pad-jabbing. My brain’s left distinctly unteased. But there’s definitely a place for ‘trial-and-error’ in games. In mega-tough platformers like Super Meat Boy, it’s a case of ‘you don’t live, you learn’. Error is encouraged, a stepping-stone to level completion. Recently released Super Rude Bear Resurrection takes it further, emphasising the improvisational ‘trial’ side of things. Can’t walk over spikes? Try using your old corpses as a fluffy buffer! For me, one genre nails ‘trial-and-error’: toy games. Think light puzzlers like Hohokum or Gnog. Tactile, tempting, covered with ASMR-friendly doodads, they invite experimentation for experimentation’s sake. ‘Error’ doesn’t mean the end.